What is involved in deliberating within an activist group? This isn’t quite as simple a question as it might appear. Deliberation has to do with a discussion among a number of people aimed at arriving at a degree of consensus about facts, policies, and strategies. But it grades off into several other collective activities: contention over power and influence, efforts to deceive or manipulate, efforts to mobilize people over emotional issues. Most examples in the deliberative democracy literature involve processes in which the task is simply to arrive at a majority recommendation about a fairly well defined issue, with the process increasing in persuasive force according to the strength of the majority. But a process like this doesn’t have to cope with the issue of maintaining the coalition after this one action. Activist groups, by contrast, are not regulated by formal rules of voting leading to a single adopted resolution, they are not bound by majority vote, and they are not concerned about simply coming to a decision about a single resolution. So let’s consider one aspect of activist debate: the communicative effort by members of a group to sort out what they should do collectively, given the framing goals and values they share. The individuals and groups have come together because they share commitment to some purpose or goal. (Though there is always the possibility of uncommitted visitors and even provocateurs whose goals involve side-tracking the purposes of the rest of the group.) So how can individuals and sub-groups engage in a process that leads to a degree of consensus about future actions? Here I take it for granted that activists share goals and values. But this is not wholly true. They may share a high-level concern — ending racism, pushing for sustainability — but may disagree sharply about finer details. So reaching consensus about action is often made more difficult by the fact of disagreement about important goals and values. For example, an environmental activist group may disagree about the scope of their collective efforts — global sustainability or improvement of their own region’s environmental quality. Another important source of disagreement arises a step closer to action, deriving from differing theories of how social change works. One segment may think that the primary tactics should involve getting effective messages to the broader public through media coverage, whereas another group may think that it is essential to get the attention of policy makers through consequential and visible direct action. With broad disagreement about efficacy of various possible strategies, it is difficult to achieve consensus. One option that exists in this case is for each camp to make an empirical or historical argument supporting its claims of efficacy; to the extent that opponents are open to rational assessment of evidence at this level, it is possible to narrow disagreement about efficacy. In other words, rational persuasion based on evidence and inference is one possible avenue of communicative interaction within a group of similar-minded activists. But often partisan groups are as committed to their models of social action as they are to the ultimate outcomes. The whole situation of activist deliberation is complicated by the fact that a social movement at any level of scale depends on the willing participation of individuals and sub-groups. So a degree of consensus is a practical necessity, if the movement is to maintain itself as an active and activist conglomeration capable of any form of collective action. To the extent that a proposed plan of action diverges substantially from the preferences and interests of a sub-group, there is the likelihood of defection of that group. There are a couple of features of collective action that seem to make the problem of factions somewhat more manageable than it first appears. First,there is a degree of solidarity involved in almost every social movement; and a widespread feeling of solidarity provides some degree of motivation for each individual to join the collective action even if it is not one’s first choice. In other words, activists often have a degree of willingness to support the decisions of the group even if they are on the losing side — unless the differences are sufficiently fundamental! Second, individuals and groups are capable of compromising: they can agree to an action plan in which Group A gets most of what it wants, but it promises to pursue part of what Group B wants as well. And if there is a degree of inter-group trust, this may be sufficient to get both A and B to work together on the agree-upon plan. David Graeber’s Direct Action: An Ethnography is a fascinating ethnography of anti-globalization activists preparing for a complex series of actions at the 2001 Summit of the Americas meeting in Quebec. As Graeber makes clear, these loosely affiliated anarchist groups were effective at planning and coordinating action. Here is an earlier discussion of Graeber’s book (link). What is involved in assembling the history of a complicated period like the US civil rights movement? This is a difficult question for any complex historical phenomenon, and there are many choices that the historian is forced to make. When should we start the story? Are we interested in large social and economic structures or individual leaders and groups? How did new urban concentrations of African Americans affect the movement? How did limitations on property rights and Jim Crow laws affect the struggle? 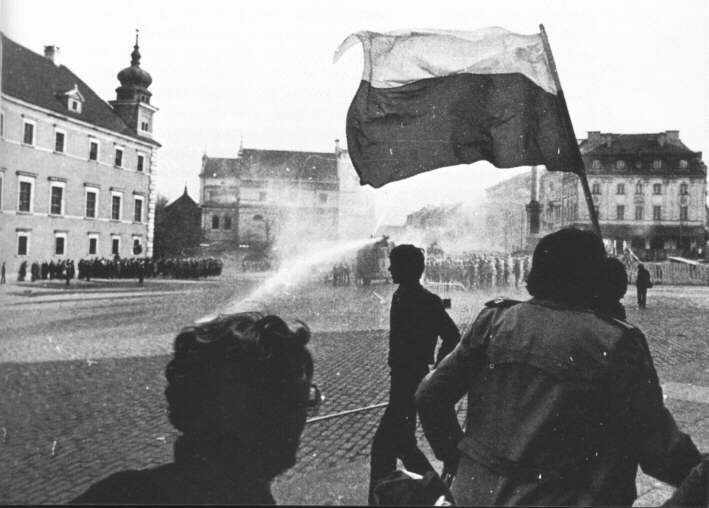 What role did state and Federal law play in creating the conditions for mobilization? What is the point of the history? The question of when to start the story is certainly an important one. If our interest in the movement is how it worked — who were the important leaders, how did the key organizations get started, and so forth — then perhaps beginning in the 1950s is the right choice. This would be to look at the movement through the eyes of a sociologist. But if we really want to know what the context and causes of racial inequality were, then we need to start much earlier. On this framing of the problem, we are interested in longterm causes and contexts, not simply the particulars of the struggle. In this case the realities of slavery and the Jim Crow south are crucial, and the starting point needs to be sometime following the end of the Civil War. Doug McAdam’s Political Process and the Development of Black Insurgency, 1930-1970, 2nd Edition takes its orientation from specific answers to several of these questions. His fundamental goal is to understand the Civil Rights period of the 1960s as a social movement. He wants to understand the ordinary people who came to be mobilized in marches, demonstrations, and boycotts; he wants to understand the organizations that facilitated these acts of mobilization; and he wants to understand the legal and political context within which this mobilization took place. He begins his account in the 1950s, taking the historical facts of racial inequality and oppression as a given. And he attempts to discover the factors that led to the successes and failures of this prolonged period of activism and protest. There is not a great deal of narrative in McAdam’s book — he doesn’t tell a lot of stories of the particulars of various moments of activism, and he doesn’t attempt to give the reader a strong feeling for the experience of ordinary African American participants. Instead there is a sustained effort to quantify and understand the timing and location of various moments of public activism. And he wants to understand the national and international factors that were conducive to mobilization in those years. Taylor Branch’s trilogy on the history of the same period of time takes a very different point of view (Parting the Waters : America in the King Years 1954-63). Branch’s narrative gives strong priority to giving the reader a vivid sense of the actors — from leaders like Martin Luther King, Jr., to ordinary African American participants who were inspired to great involvement in the movement. His book is based on a wide range of primary sources, including FBI files, and it is committed to providing a detailed and accurate account of the events of the movement. He organizes his narrative around key events (the Freedom Rides, Selma, the Memphis boycott) and key individuals (Martin Luther King, Jr., J. Edgar Hoover). The trilogy is long and detailed; and yet it doesn’t answer all the kinds of questions mentioned above. Lance Hill’s The Deacons for Defense: Armed Resistance and the Civil Rights Movement pulls the screen into a tighter focus by concentrating on a smaller geography and a specific element of the movement — the emergence of a grassroots organization that favored armed self-defense against organizations like the KKK. Hill’s narrative gives the reader a very strong sense of the places and people of this organization — the circumstances in which they lived, the personal experiences that led them to this form of activism, and the ways in which this strategy played out in Louisiana and Mississippi. The reader gets a vivid understanding of the human circumstances of white violence and organized efforts at self-defense, and the actors become real through the narrative. These are just three examples of different approaches taken by historians and historically minded sociologists to the challenges of representing and understanding this crucial period in American history. They illustrate a basic point about historiography more generally: every historical topic admits of treatment from a wide range of perspectives and methods, and the stories that are told will provide very different insights into the history. Elinor Ostrom was a very important contributor to the theory of public rationality and the institutions that underlie cooperation, and she was most deserving of the recognition that accompanied her receipt of the Nobel Prize in Economics in 2009. Her passing today is a sad loss for the academic world. Rational choice theory has been unfriendly to the idea that communities can self-regulate when it comes to public goods and public harms. Garrett Hardin offered the theory of the “tragedy of the commons”, in which he argues that rational egoists will inevitably overuse a common resource. And Mancur Olson offered similar arguments about the feasibility of collective action in an extended group in The Logic of Collective Action: Public Goods and the Theory of Groups. Against these views, Ostrom and her research collaborators demonstrated that human communities have actually created a number of informal institutional complexes for regulating access to common resources that succeed in creating a stable balance between use and resource renewal. Ostrom demonstrated, both theoretically and empirically, that legal regulation is not the only possible solution to public goods problems. Instead she documents community-based solutions to common property resource problems that have proved successful over multiple generations. 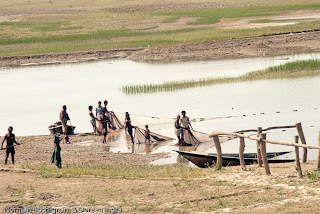 These are quasi-voluntary arrangements through which a community of users (fishers, grazers, irrigators) are able to manage the resource collectively and control violators, in such a way as to preserve the resource over time. And she points out that these institutions can be self-maintaining, in that participants have an incentive to watch out for cheaters and shirkers. In describing the Alanya inshore fishing system in detail she writes, “The process of monitoring and enforcing the system is, however, accomplished by the fishers themselves as a by-product of the incentive created by the rotation system” (19-20; kl 378). Essentially her research comes down to this point: There are multiple possible property systems through which access to natural resources can be mediated. A simple Lockean theory of private property holds that all goods have individual private owners. It is possible, however, to conceive of forms of “social property” or community property through which at least some assets are held in common, and for which there are fair and well-defined procedures for providing rights of access to the use and enjoyment of the social property. 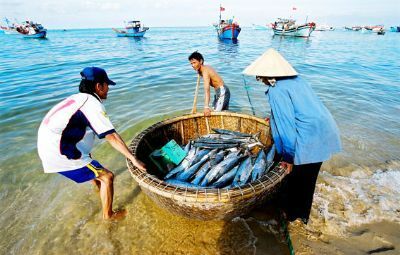 As Ostrom demonstrated in depth, there are socially feasible arrangements in which a “common property resource” such as a fish stock is exploited by a number of independent producers within the context of a stable community. In this instance we have a combination of private property (nets and boats) and social property (the waterway and fish stock), and Ostrom documents several different sets of social rules that establish the terms of access and use that individuals will have to the common property resource. There is extensive debate over the economic efficiency or viability of social property arrangements such as these. 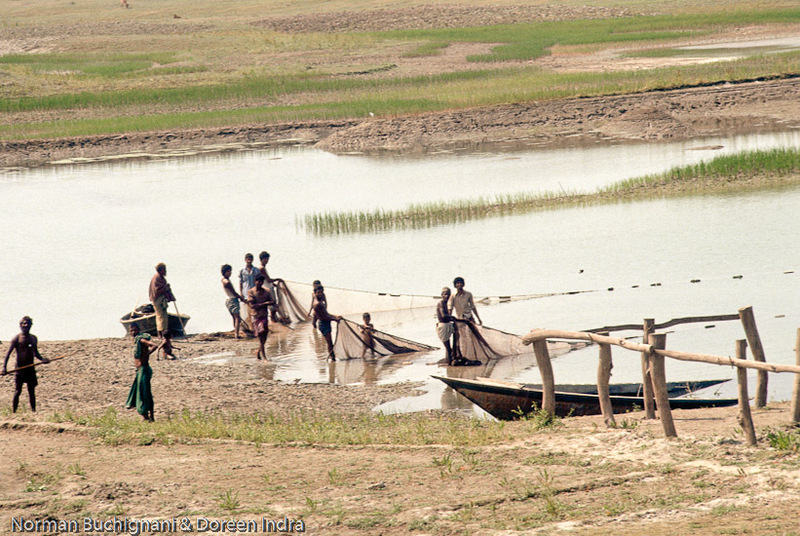 Concerning fisheries and traditional practices of forestry, for example, there is the familiar argument that rationally induced free-riding will eventually undermine the community-based rules of use. The point here not that social property regimes are superior, but rather that they are possible. And Ostrom’s research illustrates a great variety of common-property resource regimes that appear to be efficient and stable. It is therefore a matter of public debate which particular rules and institutions ought to govern the use of property. And there may be something in this finding that provides new ways of thinking about economic arrangements in the twenty-first century as well. Speech Acts: An Essay in the Philosophy of Language made a big impression on the field of the philosophy of language when it appeared in 1969. But its author, John Searle, thinks the theory of speech acts has a much broader scope than simply the philosophy of language; he thinks it provides a foundation for the philosophy of mind, and — of particular interest here — for the philosophy of society. Two books in the past decade or so have pushed this programme forward — The Construction of Social Reality (1995) and Making the Social World: The Structure of Human Civilization (2010). So — how much insight into the social world can we get from the ideas underlying speech act theory? Status functions are fundamental, according to Searle, because they are the bearers of rights, obligations, and norms — what he refers to as “deontic powers.” As a member of the American Philosophical Association, I have a right to attend the annual conference, and this right is embodied in the states of intentionality of other actors who recognize that status and the associated right. “So status functions are the glue that holds society together. They are created by collective intentionality and they function by carrying deontic powers” (kindle loc 225). Searle thinks that rules, institutions, and collective intentions are the fundamental “atoms” of social phenomena; and — this is the dogmatic part — he thinks that these all depend on one mental action, which he refers to as a Status Function Declaration. He holds that we cannot understand the working of a rule, a socially embodied obligation, or a socially embodied right, without postulating a commonly recognized Status Function Declaration that establishes that practice. And, sure enough — a status function declaration is a form of a speech act. So speech acts, and the linguistic intentionality that they express, are the foundation of all social phenomena. “All of institutional reality is created by linguistic representation” (kindle loc 313). Voila. What this all seems to boil down to, is three points: (1) Social interactions always involve language, both internally in thought and externally in communication. (2) The idea of a norm is an inherently social idea that needs to be embodied in the beliefs and attitudes of the individuals in the group through linguistically framed mental representations. (3) Norms need to be shared and publicly articulated if they are to be socially real. Searle represents these three common ideas in a more technical vocabulary: individuals have individual and collective intentionality; individuals have deontic commitments; and deontic commitments result from status function declarations — speech acts of a specific kind. So, according to Lewis, coordination through tacit or implicit convention is a common feature of social life, and it does not require a deontic speech act for its effectiveness. (In fact, Lewis argues that the arrow points the other direction: language presupposes conventions rather than being a necessary condition to the possibility of a convention.) Lewis’s analysis is responsive to condition (3) above as well; Lewis has demonstrated how a practice can become “common knowledge” and effective in regulating coordinative and cooperative behavior, without ever having been expressed through a deontic declaration. So it seems that Searle’s insistence on the inescapable role of language and performative speech acts goes beyond what is justified by the facts. The social is not reducible to a set of logical characteristics of language. That said, it is of course true that human social life — coordination, planning, strategizing, conspiring, cooperating, and competing — is enormously dependent on our species’ ability to use language to express our thoughts and intentions. But we don’t gain very much by paraphrasing social action in the language of speech acts; the real challenge for the social scientist is to explain social outcomes, not to redefine them. Most fundamentally, we would hope that the philosophy of society or the philosophy of social science will help to formulate better theories and better research questions in the social sciences. The hard part of the social sciences is not arriving at a logical analysis of how institutions and norms can be defined in terms of something else; it is rather the difficult challenge of sorting out real human behavior within a set of institutions and explaining outcomes on that basis. But because of its single-minded focus on a single logical hypothesis, Making the Social World doesn’t really do that. It is a formal treatment of the supposed relationship between institutions and speech acts that unfortunately does not provide substantive insight into the workings of real social institutions or human behavior. By official count, the incidence of popular protest in China has increased ten-fold in the past fifteen years. Kevin O’Brien and Rachel Stern report that the Chinese state reported 8,700 “collective incidents” in 1993, and this number had grown to 87,000 by 2005 (12). And the issues that have evoked protest have expanded as well: land seizures, egregious local corruption, lay-offs and labor mistreatment, ecological and environmental concerns, and the Sichuan earthquake and building collapses, for example. 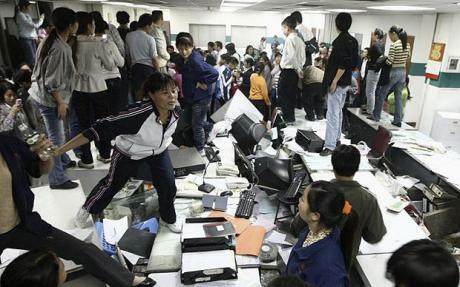 (The photo above is drawn from a 2008 story on factory protests in Dongguan in the Telegraph (link).) A recent volume by O’Brien and Stern, Popular Protest in China , is a collection of some of the best current work by China scholars on popular protest in contemporary China. Contributors include some of the researchers who are doing the most detailed work on this topic today, including William Hurst (The Chinese Worker after Socialism) , Kevin O’Brien (Rightful Resistance in Rural China) , Guobin Yang (The Power of the Internet in China: Citizen Activism Online) , and Yongshun Cai (Collective Resistance in China: Why Popular Protests Succeed or Fail). So the volume offers an excellent perspective on the state of the field. Sidney Tarrow frames the volume by observing that there has been a welcome recent convergence between China studies and the field of contentious politics. The contributors to the volume have made productive use of some of the core concepts of the theories of contentious politics that have been developed in the past two decades — resource mobilization, political opportunity, issue framing, social networks, issue escalation, etc., that have proven so productive in the analysis of a range of instances of contention and collective action. And Tarrow poses a comparativist’s challenge: to what extent is it possible to discern similar processes of mobilization and escalation in the China case? Further, Tarrow points out that much of the theorizing about contentious politics has taken place in the context of more democratic regimes; so how much of a difference does the fact of China’s authoritarian political system make for the occurrence and character of social contention? Each chapter focuses, by and large, on a different thread within the current literature on contentious politics: framing (William Hurst), trust (Teresa Wright), transnational actors (Patricia Thornton), leadership (Feng Chen), networks (Yanfei Sun and Dingxin Zhao), repression (Yongshun Cai), communication (Guobin Yang), and opportunity (Yanfei Sun and Dingxin Zhao). As such, the volume also serves as something like a tutorial on current theories of contentious politics. Liz Perry’s concluding essay frames the argument around “rebellion” (protest against particular officials) versus “revolution” (protest against principles and structures of government). And she is inclined to think that the rise in protest in China today falls in the former category — mostly harmless from the point of view of the power and structure of the regime. But I’m inclined to think that this misses one of the most important implications of the contentious politics literature, and the import of its most important case. Small-scale mobilization and protest can escalate to fundamental and widespread demands for justice. And a broad movement can emerge that is not revolutionary — devoted to the overthrow of the state — and yet is persistently transformative: dedicated to the long, slow transformation of society and state in the direction of equality and dignity for all members of society. The great historical example of this — the example that motivated some of the best work in the literature of contentious politics — is the American civil rights movement. This movement demanded a fundamental change of law and of culture, and it succeeded. And we might say that this is what ordinary people in China today demand and deserve. The demand for voice and legal protections of lawful activities that swims throughout the more specific claims currently being made has the potential of becoming a very widespread movement. China has witnessed a visible increase over the past ten years in the number of protests, demonstrations, and riots over a variety of issues. Areas of social problems that have stimulated collective protests include factory conditions, non-payment of wages, factory closures, environmental problems (both large and small), and land and property takeovers by developers and the state. It isn’t surprising that social conditions in China have given rise to causes of protest. Rapid growth has stimulated large movements of people and migrant workers, development has created massive environmental problems for localities, and opportunities for development have created conflicts between developers and local people over land and property rights. Following the terrible earthquake in Sichuan and the collapse of many buildings and schools with tragic loss of life, there was a wave of angry protests by parents against corrupt building practices. So there are plenty of possible causes for protest in China today. What is more surprising, though, is that the state has not been successful so far in muzzling protest, or in keeping news of local protests from reaching the international public. Will the sociology of the future be able to use the contents of YouTube, Twitter, or Facebook as an important empirical indicator of social change in societies such as China, Malaysia, or Russia? One thing is evident from this small experiment: YouTube is not an archive, and researchers are well advised to capture and document the items they want to study. We live in a society that embraces the market in a pretty broad way. We accept that virtually all goods and services are priced through the market at prices set competitively. We accept that sellers are looking to maximize profits through the prices, quantities, and quality of the goods and services that they sell us. We accept, though a bit less fully, the idea that wages are determined by the market — a person’s income is determined by what competing employers are willing to pay. And we have some level of trust that competition protects us against price-gouging, adulteration, exploitation, and other predatory practices. A prior posting questioned this logic when it comes to healthcare. Here I’d like to see whether there are other areas of dissent within American society over prices. So where do contemporary Americans show a degree of moral discomfort with prices and the market? Where does the moral appeal of the principles of market justice begin to break down — principles such as “things are worth exactly what people are willing to pay for them” and “to each what his/her market-determined purchasing power permit him to buy”? There are a couple of obvious exceptions in contemporary acceptance of the market. One is the public outrage about executive compensation in banking and other corporations that we’ve seen in the past year. People seem to be morally offended at the idea that CEOs are taking tens or hundreds of millions of dollars in compensation — even in companies approaching bankruptcy. Part of the outrage stems from the perception that the CEO can’t have brought a commensurate gain to the company or its stockholders, witness the failing condition of many of these banks and companies. Part is a suspicion that there must be some kind of corrupt collusion going on in the background between corporate boards and CEOs. But the bottom line moral intuition seems to be something like this: nothing could justify a salary of $100 million, and executive compensation in that range is inherently unfair. And no argument proceeding simply along the lines of fair market competition — “these are competitive rational firms that are offering these salaries, and therefore whatever they arrive at is fair” — cuts much ice with the public. Here is another example of public divergence from acceptance of pure market outcomes: recent public outcries about college tuition. There is the common complaint that tuition is too high and students can’t afford to attend. (This overlooks the important fact that public and private tuitions are almost an order of magnitude apart — $6,000-12,000 versus $35,00-42,000!) But notice that this is a “fair price” argument that would be nonsensical when applied to the price of an iPod or a Lexus. People don’t generally feel aggrieved because a luxury car or a consumer device is too expensive; they just don’t buy it. It makes sense to express this complaint in application to college tuition because many of us think of college as a necessity of life that cannot fairly be allocated on the basis of ability to pay. (This explains why colleges offer need-based financial aid.) And this is a moral-economy argument. And what about that other necessity of life — gasoline? Public complaints about $4/gallon gas were certainly loud a year ago. But they seem to have been grounded in something different — the suspicion that the oil companies were manipulating prices and taking predatory profits — rather than an assumption of a fair price determined by the needs of the poor. Finally, what about salaries and wages? How do we feel about the inequalities of compensation that exist within the American economy and our own places of work? Americans seem to accept a fairly wide range of salaries and wages when they believe that the differences correspond ultimately to the need for firms to recruit the most effective personnel possible — a market justification for high salaries. But they seem to begin to feel morally aggrieved when the inequalities that emerge seem to exceed any possible correspondence to contribution, impact, or productivity. So — we as Americans seem to have a guarded level of acceptance of the emergence of market-driven inequalities when it comes to compensation. One wonders whether deeper resentment about the workings of market forces will begin to surface in our society, as unemployment and economic recession settle upon us. Power and influence. 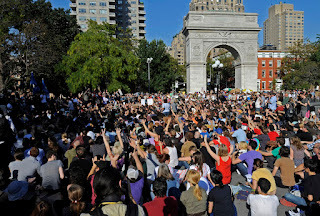 How effective are mass demonstrations at achieving their declared goals? Do mass demonstrations influence government and multinational policies in the direction intended by the organizers and followers? For that matter — how much of an influence can a large demonstration in Rome have on a subsequent effort to mobilize over a similar issue in New York? What is the role of mass media in the timing, pace, and public impact of large demonstrations? Mobilization. What processes of mobilization and organization are at work in these specific periods of mass mobilization? To what extent do modern transnational protests embody a significant degree of common purpose and political identity? (Here’s a recent post on the difficulty of defining a group mentality.) What organizations have the most influence in determining the strategy and tactics of the mass political actions that are called for? What networks of leaders and counter-politicians can be discerned in the period of mobilization leading up to the mass event? What is the nature of the networks that exist within the various communities of interest — environmentalists, anti-war activists, anti-globalization activists? What sorts of issues have proven most potent in mobilizing significant numbers of adherents and organizations from different countries? What motivates followers to heed the call and bring themselves to London or Strasbourg? What is the combination of commitment, identity, and adventure that results in involvement? Internal politics. 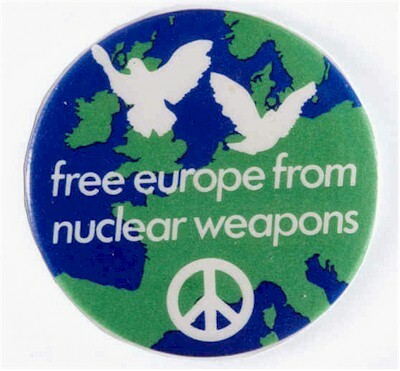 What factors internal to a movement — whether environmentalist, anti-globalization, anti-war, anti-nuclear — lead to cohesion and dissension within the movement? What factors lead to the occasional outbreaks of violence between protesters and police? (See an earlier post on this question.) Is violence a deliberate tactic on either side — militants or forces of order? What role do organizations such as anarchist groups and other radical, rejectionist groups play within the broader movement? Is it possible for small groups of rejectionists to “hijack” the large demonstration for their own purposes? These questions overlap several distinct areas of research: resource mobilization theory, social movements, international relations theory, and comparative politics. (This is a point that McAdam, Tilly, and Tarrow make in Dynamics of Contention : there is much to be gained by studying these contentious movements across the traditional areas of study.) And the questions are probably further complicated by the availability of internet-based forms of communication and mobilization. Students of domestic movements long ago determined that collective action cannot be traced to grievances or social cleavages, even vast ones like those connected to globalization. Acting collectively requires activists to marshal resources, become aware of and seize opportunities, frame their demands in ways that enable them to join with others, and identify common targets. If these thresholds constitute barriers in domestic politics, they are even higher when people mobilize across borders. Globalization is not sufficient to explain when people will engage in collective action and when they will not. Nor does combating globalization automatically give rise to “global social movements.” For Charles Tilly, a “social movement” is “a sustained, organized public effort making collective claims on target authorities” that uses a well-hewn contentious repertoire on the part of people who proclaim themselves to be worthy, unified, numerous, and committed. For one thing, forming transnational social movements is not easy. Sustaining collective action across borders on the part of people who seldom see one another and who lack embedded relations of trust is difficult. For another, repertoires of contention grow out of and are lodged in local and national contexts. Even more difficult is developing a common collective identity among people from different cultural backgrounds whose governments are not inclined to encourage them to do so. Tarrow’s central hypothesis about transnational protest movements comes back to the core idea of “opportunity structures.” International organizations and networks have created a new set of opportunities for transgressive groups who have an interest in challenging the status quo. Tarrow identifies several important types of sources of evidence and theory for his current work: international political economy, anthropologists and students of public opinion, specific studies of international protest events, studies of transnational networks and institutions, and theorists of the idea of “global civil society.” He explicitly locates the book as falling squarely within the research program established in Dynamics of Contention; his goal is to make use of this ontology of social mechanisms and processes to provide a sociology of transnational protest. What I’m eager to see is some of the concrete empirical work that this approach suggests: specific empirical studies of the networks, organizations, and dynamic processes through which major transnational protests have unfolded in the past decade or so. It would seem that some important new tools helpful for such study are now much more readily available — essentially, using the internet to track organizations, announcements, and efforts at mobilization. Tarrow provides some of this research — for example, in his summary of research on the networks and localism of participants in the “Battle of Seattle”. But this level of analysis seems to be where the action needs to be at this point in the study of transnational social movements. But Tarrow is certainly right in thinking that this subject area is important, and it is one that follows very logically from the framework of analysis of social contention developed by himself, Doug McAdam, and Charles Tilly in the earlier Dynamics of Contention. There is a pretty high level of social protest taking place in France today. Strikes and demonstrations are taking place in many cities, involving students, faculty, workers, and other ordinary people. (Here is a recent news roundup dated March 19, 2009, on strikes, demonstrations, and manifs in the past month or so, and here is a BBC report on a round of large strikes in January.) The demands largely have to do with the current economic crisis, unemployment, changes in the social security system, and proposed reforms to higher education. French people are demanding specific changes from the government, and the government does not seem to want to compromise. These collective actions carry out a tradition of public protest in French political culture that goes back at least a century and a half (Charles Tilly, The Contentious French ). And few politicians in France will have overlooked the fact that public protests have sometimes developed into even more confrontational forms of collective action and conflict — in 1968, for example, and in the banlieue in 2005. So the current round of protests and mass demonstrations has a significance in French political history that raises the possibility of even more intense civil conflict in the next twelve months. What is to prevent the possibility that large organized demonstrations and strikes may develop into more violent conflicts between the population and the state in the future? How can the state ensure that large-scale peaceful protest — a basic democratic right — doesn’t turn into episodic rioting and civil unrest when political stalemate emerges or when economic and social conditions worsen? The question is a pressing one, because very large demonstrations and protests are volatile and unpredictable. When there are tens of thousands of participants and a range of leading organizations in a large demonstration, it is possible for the actions of the crowd to develop in ways that were not intended or anticipated. A peaceful march down a central boulevard can proceed from beginning to end with a great deal of internal discipline, with organizations maintaining ranks and preserving order. Many of the photos of manifs in French cities are distinguished by the prominent signs and banners the protesters carry announcing the organizations they represent — labor unions, student organizations, faculty groups. And these banners themselves are an indication of organization and discipline. So large, peaceful protests can be organized and carried out successfully. But the same march can also degenerate into skirmishing and street fighting involving small groups of activists and police. 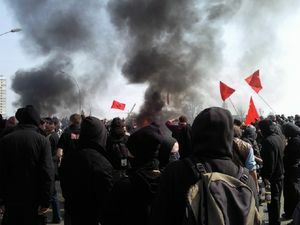 A small splinter group of violent protesters may break away from the march to engage in acts of violence against property — burning cars, smashing shop windows. And these acts may spread by contagion to other parts of the crowd. Or a group of activists may deliberately confront the police with stones or bottles, with the goal of provoking violent reaction and an escalation of conflict. (This appears to have happened repeatedly in Athens a few months ago, and it was an anarchist tactic in the anti-globalization protests that took place in many cities a few years ago.) Or a group of police may engage in a demonstration of power intended to intimidate the crowd, leading to police violence against members of the crowd; again, this violence may spread to other locations. Even an unfortunate accident can lead to an outburst of violence — a frightened driver losing control of his car and injuring a group of demonstrators, for example, can lead to panic and escalation. 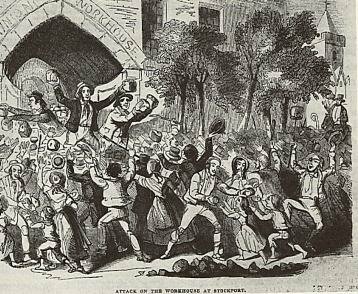 And any of these small outbreaks of violence can spread through the larger crowd, leading to an uncontrollable spasm of action and reaction. So how can the authorities in a democracy develop strategies for ensuring that peaceful protests avoid violent escalation? I suppose the most direct strategy is to consider the demands themselves and evaluate whether they legitimately call for changes of policy that ought to be enacted. Compromise over the central issues leading to mass protest presumably has some effect on the likelihood of violence and disorder. If the people are convinced that the government is acting unjustly, the government ought to at least consider whether there is some legitimacy in these complaints. A second strategy is more tactical. Recognizing that protest is likely to occur, it makes sense for the authorities to work with the organizers and their organizations to arrive at agreements about the scope and nature of the protest. The route, location, duration, and other conditions of the protest can be negotiated. And the authorities are well advised to attempt to gain the support of the organizers in an agreement to maintain internal discipline within the demonstration — to win the agreement of the organizations themselves to attempt to suppress possible outbursts of violence by minority elements within the crowd. A third strategy involves, of course, policing. 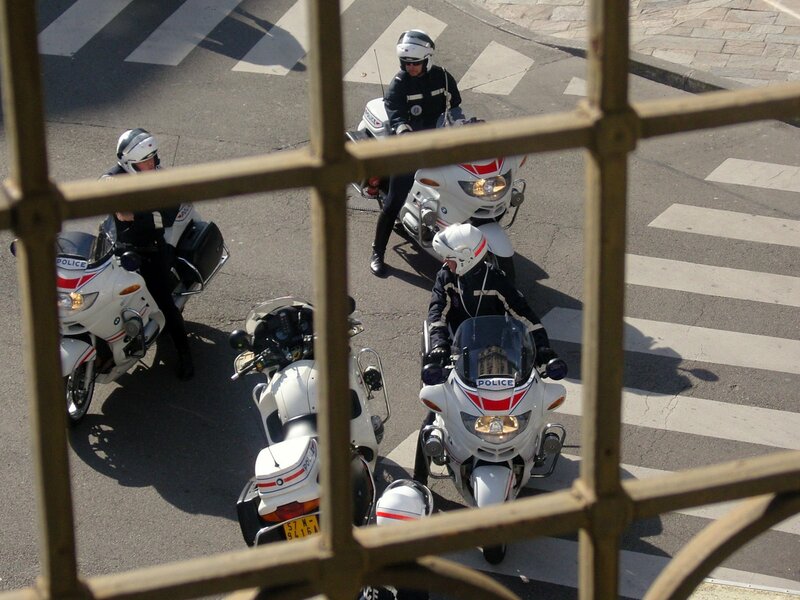 The authorities have both the ability and the obligation to use police powers to ensure public order. And this means that they need to plan intelligently for the disposition and behavior of police forces to contain possible violent outbursts. But the use of police force is a delicate political art. Heavy-handed, intimidating policing seems to be as likely to provoke violence as to suppress it. Police behavior that depends upon the conspicuous threat of force likewise is likely to be provocative — a double line of police with truncheons and riot gear, with face shields providing a disturbing anonymity, is likely to provoke fear and aggression in the crowd that it confronts. And, of course, police behavior that crosses the line to overt acts of brutality is almost certain to provoke violent response, as news of police violence spreads through the crowd. But it is also possible to err on the side of insufficient police presence; forces that can be quickly overwhelmed create the situation of a sudden escalation of violence by a crowd that has suddenly realized that there is no barrier to further violent actions. What makes this question so complicated is the fact that it involves social actions, conflicts, and relationships at many levels: the basic conflict between organized groups with explicit demands and the state with its interest in enforcing its policies; the limited degree of control that protest organizers have over the behavior of followers; the fact that smaller groups and organizations within the protest movement may have goals that are more radical than those of the main organizations; the fact that the authorities have only limited control over the forces at their command; and the fact that there may not be acceptable compromises that successfully resolve the conflict between protesters and the state. These factors make the behavior of the crowd somewhat unpredictable, and they introduce major sources of contingency into the way in which a particular day of protest and season of dissent play out. Bringing the discussion back to France in 2009, there seem to be several large possibilities for the coming year. The government may decide that it needs to adjust some of its policies in order to reduce the level of popular dissent and unrest; it needs to reach a social compromise. The government may hold firm but the dissenting organizations may grow fatigued or discouraged — so that the current round of protest and strikes subsides. Both sides may hold firm but an equilibrium level of protest and response may be reached, with neither side escalating to a higher level of civil conflict and violence. Or, finally, both the government and the protest movement may hold firm and protests may spiral upward into greater levels of social conflict, with riots and violent protests ensuing. More and more force may be exerted through police repression, and this may lead to more widespread and more aggressive demonstrations in the following weeks. And, of course, all of these scenarios are likely to have consequences for electoral outcomes in the coming several years. What is involved in acting as a group? What is the difference between a crowd of pedestrians crossing Mass Ave in Cambridge when the light changes and a group of students marching into Harvard Hall in an attempt to initiate a protest? How about the difference between a group of history graduate students pursuing research simultaneously but separately on early New England diseases in Widener Library, and a research group of scientists collaborating to discover the mechanism of HIV transmission at the cellular level? The intuitive answer to these questions is pretty clear. A group activity requires some level of collective intentions and purposes on the parts of the participants towards each other and towards the group itself. A group is more than an ensemble of individuals performing a similar set of actions (pedestrians, independent researchers). Rather, we want to see some indication that the individuals regard themselves as members of the group; that they embrace some conception of the action that members of the group propose to perform; and that they individually choose their plans of action out of consideration of this group or collective purpose. In a group’s actions, the individuals who make up the group are oriented towards the group and its goals and purposes. In other words, groups are constituted by some form of group-oriented intentionality on the part of individual members, and group actions are performed by individuals who have adopted a set of beliefs and attitudes towards other members of the group and its collective purposes. There are quite a few complications that arise here, however. Here is one: many collective activities involve participants with a wide range of affiliation with the collective purpose. There are core members who explicitly and emphatically declare adherence to the collective goal and plan. There are some who are willing followers without a clear idea of the purpose or plan. There are opportunistic joiners who have their own private reasons for joining the group project. And there may even be a degree of disagreement within the group about goals, strategies, and tactics — with the result that many committed members nonetheless differ from each other with respect to their collective intentions. And these aren’t sharp distinctions in most cases — so a given collectivity may consist of a deeply mixed group of individuals with respect to their understandings, purposes, and affinities for the collective action. Several philosophers have focused on this set of problems surrounding “group intentions”. Margaret Gilbert thinks there is a sharp distinction between group intentions and individual intentions (On Social Facts ). More recently, Raimo Tuomela refers to “we” intentions and “I” intentions in order to explain the defining characteristics of group behavior in The Philosophy of Social Practices: A Collective Acceptance View . Both Gilbert and Tuomela seem to think that groups have intentions that are autonomous from the purposes and intentions of members of the group — a sort of Durkheimian view of the autonomous reality of the mentality of groups. What these approaches have in common is a desire to postulate a strong distinction in levels between group intentions and individual intentions. Gilbert’s primary contention is that the notion of a collectivity—individuals constituting a group—is the central feature of social ontology. And she maintains that this concept can best be analyzed by the idea of a “plural subject”—the referent of the first-person plural pronoun, “we”. The core of Gilbert’s theory of social groups involves the idea of the mutual recognition by a set of persons that they are engaged in some joint actions or beliefs. “A set of people constitute a social group if and only if they constitute a plural subject”; and a plural subject is “a set of people each of whom shares with oneself in some action, belief, attitude, or similar attribute” (p. 204). Gilbert argues that the pronouns “us” and “we” are the linguistic elements through which we refer to plural subjects in English. And she believes that plural subjects exist; they are not fictions or constructions, but agents which have beliefs, perform actions, and succeed or fail in carrying out their intentions. According to Gilbert, “social groups are plural subjects, collective beliefs are the beliefs of plural subjects, and social conventions are the ‘fiats’ of plural subjects” (p. 408). Gilbert argues against the individualism of Max Weber, by arguing that collectivities are the central subject of the social sciences, and that collectivities cannot be subsumed under individualist concepts. Thus Gilbert suggests that her theory offers support for holism over individualism (p. 3). I don’t find this collectivist approach to “individuals behaving as groups” at all convincing, for several reasons. One is the point mentioned above about the heterogeneity of individual motivations and purposes within a group activity. This seems to imply that there couldn’t be a coherent, univalent group intention that stands separate from the individuals who constitute the group. Instead, there are only the somewhat polyglot collective intentions within agents, with some degree of within-group communication and shaping about their shared collective purposes. Second, there is the general skeptical point about “spooky” social entities — entities that are thought to have an existence independent from the states of agency and mind of the individuals who make up the social world. 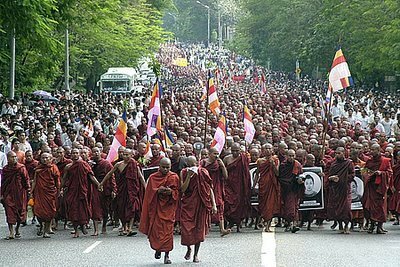 How could one possibly imagine that there is a collective intention associated with the Burmese monks in 2007, standing separate and independent from the beliefs, assumptions, loyalties, and adherences of many individual monks and networks of monks? And here is a third puzzle. We need to have some idea of the concrete social processes through which group-oriented intentions are created at the individual level in particular social circumstances. We need to know something about the microfoundations of group formation. It doesn’t help to simply postulate “collective intentions”; we need to have a concrete sociology of the ways in which individuals come to have group-oriented beliefs, values, and motives. Finally, the “autonomous collectivity” view doesn’t work very well when we try to use it to interpret the practice of gifted social scientists who attempt to explain collective action. 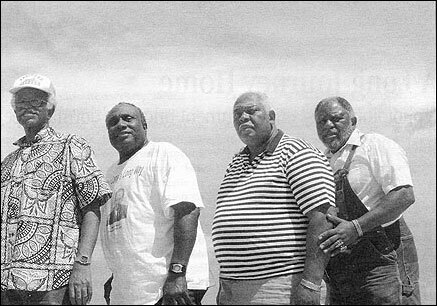 E. P. Thompson, James Scott, Chuck Tilly, Doug McAdam, and William Sewell all devote a lot of their effort to explaining how specific social collectivities came to define themselves as “groups” and came to act in a collective way. But their approaches are invariably based on understanding the many threads of mobilization, structure, and meaning at the disaggregated level that eventually build up to a movement. Thompson’s metal workers, Scott’s Southeast Asian peasant rebels, Tilly’s Vendeans, McAdam’s civil rights activists and followers, and Sewell’s Marseillaise craftsmen all reflect the variation and concrete historical construction of individual consciousness within concrete political movements that confirms the variability and agentic nature of social movements and group identity. and X has a consequent motivation to engage in the collective action. One additional condition seems to be pragmatically required in order for these conditions to arise: there must be some tangible process of communication and mobilization through which the group-oriented intentional states mentioned here are created in the various individuals. So there are mandatory group-oriented states of mind that are part of the constitution of a group. But notice this key fact: these features of beliefs, intentions, and motives that I have mentioned are all located at the level of the individual actors. There is no higher-level collectivity that possesses an independent “group intention”. So a group is constituted by the states of intentionality and belief of its members, and the concrete processes of communication and mobilization through which a degree of group-orientedness and coherence emerges within the states of mind of the participants. Weber was right after all! Fundamentally, there are only three social-intentional states postulated here: affiliation, mutual recognition, and solidarity. And there is a postulate about the micro-social processes through which these are cultivated: mobilization, communication, and embodied social networks. And this analysis in turn is entirely compatible with the perspective of methodological localism that I’ve mentioned several times here.